PENGUIN CARBON AND FILTER CHAMBERS are constructed of CPVC, polypropylene or PVDF to offer corrosion resistance for the most difficult of alkalies and acids. They contain no metal or metal coated parts to be exposed to chemicals. EPDM or Viton® O-rings in primary seal areas are designed to insure reliable sealing of the chamber. 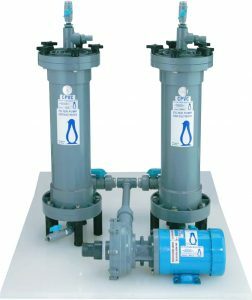 All chambers include the initial set of filter tubes - multi tube chambers include a pressure gauge and bleed valve assembly. PENGUIN STAINLESS STEEL VESSELS offer the aesthetics and operational durability of stainless steel at affordable prices. We offer a broad selection of vessels in 304 and 316 stainless steel for a wide variety of commercial and industrial applications. Penguin’s wound cartridge filters are manufactured using a high speed, continuous wind process which creates a superior one-piece filter with hundreds of diamond shaped tunnels that get progressively smaller from the outer diameter to the core. Penguin polypropylene single layered felt bags are available in micron ratings from 1 to 100. Polypropylene mesh monofilament bags are available in micron ratings greater than 100 micron through 300 micron.